In a switch from much of the Pete Carroll era, defense seems to be the major area of need for Seattle as teams begin to ramp up for the NFL draft April 25-27. The calm of the NFL offseason — the Seahawks haven’t made a transaction in almost a month — is about to turn into a storm. The Seahawks and every other NFL team will send hefty contingents of coaches, scouts and personnel execs to the combine next week in Indianapolis to ramp up the process of preparing for the draft. That will lead into the free-agency period. Players can begin signing with other teams on March 13. So what might the Seahawks be looking for? As Seattle heads into the heart of a two-month period that will largely form the 2019 roster, here’s my rating of the Seahawks’ position groups in order of which need the most help. 1. Defensive line: Seattle allowing 4.9 yards per rush last season wasn’t all on the defensive line. But it was certainly part of it. Two of the more popular football metric sites rated Seattle’s defensive line near the bottom of the league last year. Football Outsiders ranked Seattle 22nd in its overall DL ratings while Pro Football Focus had the Seahawks at 26th in their pressure ratings, or the percent of times a team got pressure on an opposing quarterback. And that was with getting Pro Bowl-level play out of end Frank Clark and tackle Jarran Reed. Seattle simply needs more of where that came from, and maybe also to add another edge rusher in case anything gets out of whack with Clark’s contract talks (he’s widely expected to get the franchise tag by the March 5 deadline). 2. Wide receiver: We’re not saying they need to go get Antonio Brown. It hardly makes sense given the team’s salary-cap structure, and they’d probably have to get rid of Doug Baldwin to make it work financially unless you want to have a massive percentage of your salary cap going to wide receiver. But with Baldwin turning 31 this year and battling injuries last year and with just two seasons remaining on his contract, the Seahawks may need to add another young receiver to this group to build for the future. Baldwin and Tyler Lockett form an elite duo, but Seattle struggled last year to get much out of the rest of its receiving corps, especially down the stretch. Seattle got just 10 combined catches out of David Moore and Jaron Brown in the final six games, including the playoff loss against Dallas in which neither was targeted. 3. 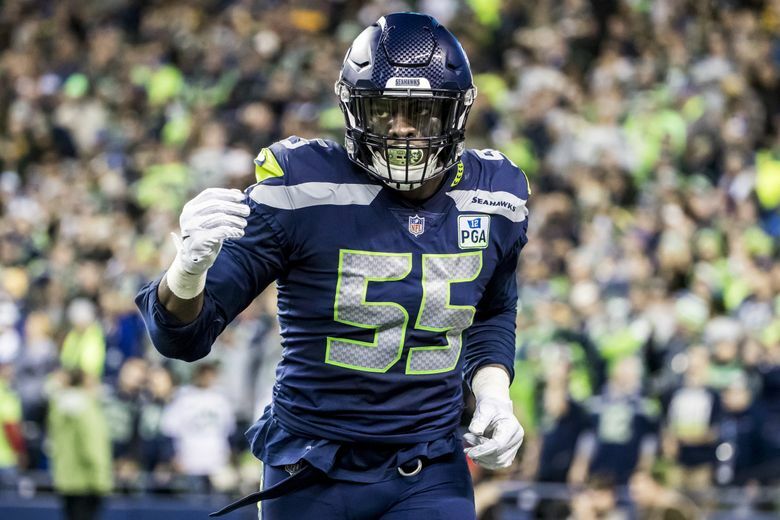 Linebacker: Not the middle, unless the team has some plans for the future of Bobby Wagner we don’t know about (he’s entering the final year of his contract in 2019). But the other spots — weakside and strongside — have an uncertain future. SLB Barkevious Mingo has just one year left on his contract. Longtime WLB K.J. Wright seems unlikely to be back, and there’s no clear successor to Wright. 4. Offensive line: Even if free-agent guards D.J. Fluker and J.R. Sweezy return, the Seahawks will still need to beef up the depth up front, especially considering Germain Ifedi has just one year left on his rookie deal and Justin Britt’s contract is such that his future beyond 2019 isn’t a certainty (he has a dead cap hit of $11.6 million in 2020 with dead money of $2.9 million). Simply put, the only 2018 starter whose situation is such that you feel sure they’ll be here in 2020 is left tackle Duane Brown. 5. Secondary: The Seahawks may feel confident in the young players they have in the secondary, and the thinking here is they won’t spend big in free agency to improve the back end. But if there’s a potential difference-making cornerback or safety who falls to them in the draft, the Seahawks have to consider it, even if they haven’t drafted a defensive back higher than the third round since 2010. Seattle could need a nickel back if free agent Justin Coleman doesn’t return, which could move the secondary higher up this list. The three-year, $29 million deal the Ravens gave nickel corner Tavon Young on Thursday won’t make it any easier for Seattle to retain Coleman cheaply. 6. Tight end: OK, in our view, there’s a huge drop in need from the first five to the rest of the list. But something has to come next on our list, and we’ll go with tight end because of uncertainty about the future of a few key players. Will Dissly, who emerged as the starter early last year, is still rehabbing a patellar tendon injury that knocked him out for the year in the fourth game; Nick Vannett is entering the last season on his rookie deal; and Ed Dickson’s contract gives him a decent chance of being a cap casualty in 2020, if not after June 1 (the Seahawks could save $3.5 million against the cap with just an $866,666 cap hit if he’s cut after June 1). And George Fant, who helped out at tight end last season, is a restricted free agent, and also could again be strictly a tackle — possibly competing with Ifedi at RT or maybe even compelling the team to move Ifedi to guard if they think that might be a better way to go on the right side. 7. Quarterback: No, not because we expect Russell Wilson to get traded to the New York Giants anytime soon. But Wilson’s long-term future obviously carries some uncertainty, and Seattle also could use a better backup than it has had since Tarvaris Jackson’s last year in 2015. The guess here is that Seattle doesn’t do anything significant at QB this offseason. But if it does, that speaks loudly to how confident the team is about re-signing Wilson. 8. Running back: Chris Carson and Rashaad Penny give Seattle a good, young duo that would seem to make drafting another running back this season unlikely (especially if Seattle re-signs Mike Davis and/or J.D. McKissic). But adding another veteran on the cheap via free agency or an undrafted rookie free agent is a given. And Seattle figures to add a fullback or two, especially if restricted free agent Tre Madden doesn’t return. But drafting a fullback seems unlikely. 9. Kicker/punter: Seattle’s kicking situation is uncertain with Sam Ficken the only one on the roster signed for 2019 (Sebastian Janikowski is a free agent). And maybe Seattle could view kicker as important enough to use a draft pick, even if it doesn’t acquire more than the four picks it currently has. More likely is adding another through free agency or an undrafted free agent.